Biology – the study of living things. From single-celled organisms to our place in the living world, Biology offers an important perspective on life. From Year 9, Biology is taught as a separate science and students begin to make distinctions between it and the other branches of science. Topics are studied in more depth and students are required to apply knowledge from earlier teaching. After Easter, students begin their GCSE course, following the Edexcel IGCSE Biology course. In Year 10, students continue with the Edexcel IGCSE Biology course. 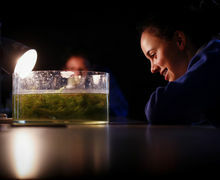 Students carry out enzyme experiments, dissect the heart and an eye ball, make working models of the lungs, measure the rate of photosynthesis in pond weed and much more. The development of investigation skills is an important element of the course and IGCSE Science courses are a good foundation for A Level Sciences. Students learn to describe and explain patterns in data and learn to evaluate the social, environmental and economic impact of scientific developments. The study of the organ systems enables students to understand how their bodies function, learning important facts about themselves and the relevance of a healthy diet and lifestyle. A level Biology is relevant to everyone and the course covers topics that are important for all. It is seen as a stepping stone to future study but it should be regarded, also, as a part of essential learning in its own right. As well as delving into complex aspects of inheritance, genetics, biochemistry and homeostasis, the Biology course also covers transport in plants, nerve message transmission and the mechanism of muscle contraction. A good biologist is able to recall a lot of information, apply knowledge accurately, describe and explain observations and patterns in data, use language accurately, and be able to carry out practical work effectively to obtain good quality results. 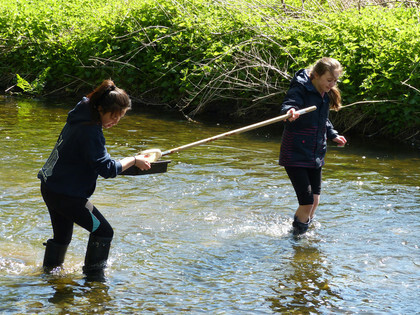 At Cobham Hall, students experience a practical approach to learning Biology, including fieldwork.